Based on the book When the Scientist Presents, this course helps all participants unlearn their bad presentation habits, and learn the proper techniques to stand in front of an audience of any size with confidence. It's no secret that rooms hosting scientific presentations often start filling up from the back row, allowing members of the audience a quick exit if necessary. Unfortunately, this state of events is sadly justified. 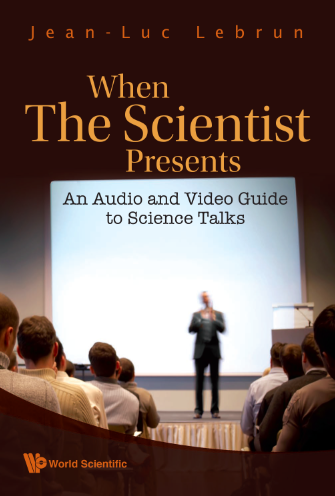 Scientific presentations can be overly technical and dry to even the hardiest audiences. They are often endured rather than enjoyed. This problem vanishes when the presenter-scientist understands and applies one core truth: a scientific presentation is not a scientific paper in oral form. While a paper transmits information through text, a presentation is anything but. Participants in this course will understand how little written text matters compared to who they are, what they say, and how they visually support their presentation. They will also tackle the three greatest obstacles that all presenting scientists face: fear, an over-technical text-heavy presentation, and a less-knowledgeable-than-expected audience. Through systematically rooting out what lessens presentation impact, and preparing a live delivery, the presenting scientist acquires confidence, fluidity in speech, and authority when handling questions. Specific activities that participants will undertake include slide redesign, delivering a 90 second elevator pitch to a decision maker, giving an oral presentation in front of an audience and camera, and an highly rated exclusive feature of this class: a complete tutorial on how to master the dreaded Q&A, including exercises. The first step to mastering presentations is being able to analyze them. The video provided is typical of scientific presentations, and could be greatly improved. While it's easy to feel that the presentation can be improved, it's considerably more difficult to identify what are the problem points. Watch the video from 00:00- 01:30 and 12:06 - 14:27. Can you determine 16 presentation problems? Submit your answer to get ours!